The first and only (to the best of my knowledge) Canadian Micra web site! 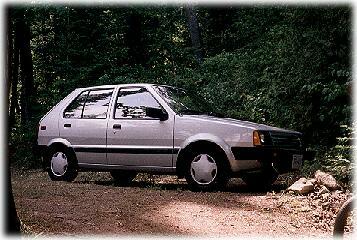 This web page is a tribute to the best econo car ever made: The Nissan Micra. 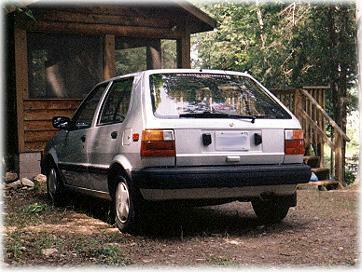 No longer sold in North America since around 1990, the fact that we still see so many Micra's still on the road today demonstrates how well this econo-car was built. A four seater two or four door hatchback, the Micra offered a lot of car for your money. Generally sold with a 1.2 litre four-cylinder carburated engine with either a 5 speed manual or 3 speed automatic, it's charm was in it's simplicity combined with features normally found in more expensive cars - no power steering, no air conditioning (both would've taxed the engine too much), no power door locks or windows available, no remote hatch release, no overflow bottle for the radiator...yet you could get intermittent wipers, child door locks on the 4 door models, a rear window wiper and washer, and a passenger side mirror. It's simplicity made it very reliable, yet it's little features here and there rewarded it's owner with some creature comforts. What's so great about this car? Well, it wasn't the world's fastest car by any stretch of the imagination. It'd hold it's own in stop-and-go city traffic, but on the highways you could forget about passing anybody and you quickly learn to get a run at steep hills. It's wheels were only 12" making for a choppy ride at times. So, what's so great about this econo-car? Very reliable. You could drive this car hard all day every day...as long as you kept the oil changed when you were supposed to, it never will complain. Even after 200,000 km's of hard driving, it still won't burn any oil. Easy to work on. Whether you're changing your brakes, replacing a rear strut, or replacing an engine component, no car could be easier. The small engine sits in an engine bay that offers plenty of room. Nothing is jam-packed in here (like more expensive cars). Lots of ground clearance. You can change the oil in this car without having to jack it up. This means good off-road capability, and great winter snow driving...and yes, easy oil changes. Cheap to own. You would be hard-pressed to find a car that's cheaper to own and maintain. $15 will fill the tank, and if you stick to city driving you can expect that to last you for a month. Parts are reasonably-priced, and easy to replace - if you need to. Generally, this is limited to belts and filters. Fun to drive. It holds it's own off the start, and even though it's sort of pathetic on the highway, it handles nicely and it's easy to maneuver even in the tightest of spaces. Lots of inside room. I moved a dresser chest of drawers in the back of mine - and yes, the hatch was closed! Open, I moved 120 6' tall cedar hedge trees. When you fold down the back seats, the room inside the back is amazing. Also, lots of headroom - more headroom than a Jeep Cherokee! Even the backseat was better than you'd expect for this type of car. Oil changes every 5,000 km's with regular filter changes. Installed new stereo and rear speakers. Replaced alternator belt as necessary. Recored the rad (removed and reinstalled in one afternoon) once. Replaced all 4 tires once. Replaced the timing belt once. Replaced the rocker arm in about an hour once. Replaced a rear strut when the old one got water inside it and froze solid causing it to break. Had car oiled (rustproofed) every fall. Did bodywork to minor rust spots on fender, doors. Tinted rear door windows and rear hatch window with sun-visor tint across windshield. Painted hub caps black when grey paint all chipped off. Kept carburator oiled with healthy dosages of WD-40 oil. Replaced fuel filter (very easy job). This car always brought me home. Notice most of the work was maintenance or fun stuff, I only recall two serious items. The rocker arm broke on the way home, and the car brought me home running on only 2 cylinders! The engine was severely underpowered and ran extremely rough...but a replacement rocker arm shaft only cost me $40 new and took an hour to install. The other time was when I blew a top rad hose. I was halfway home, and I noticed steam spewing out from under the hood. I took it easy, brought it home and for a few bucks bought a new top rad hose and replaced it in no time. Gizmo's Micra Pages: A great source for Micra info, with contributions from Yours Truly. Nissan Canada Web Site: No more Micra, but info. on the hot new Nissan's (they still make great cars). You can link to this graphic from your web page! I can be e-mailed at psquirk@hotmail.com. The contents of this web site are copyright Paul Quirk, please contact me before duplicating anything here.